This article explains what it means to be assigned to an item and how to check what you're assigned to. Being assigned to an item typically means you're responsible for it, for a given time. You can check for items you're assigned to in several ways. When you first log into GatherContent, you see the project dashboard. If you're assigned to any items in any of the projects you can see, you'll see a clickable link in the project box. When clicked, this will take you directly to the items you're assigned to. From inside a project, the first tab is the Overview tab. If you're assigned to any items in this project, you'll see a list of those items at the bottom-left of this page. Click on any item name to open it and access the content. The Content tab is where the project's content lives. If you've got access, you'll be able to find all content on this page, not only items you're assigned to. To filter the list of content to find pieces you need to action, type your name into the search bar. This will filter the list of items to pages you're assigned to. You can check this by looking for your avatar or initials next to the item. 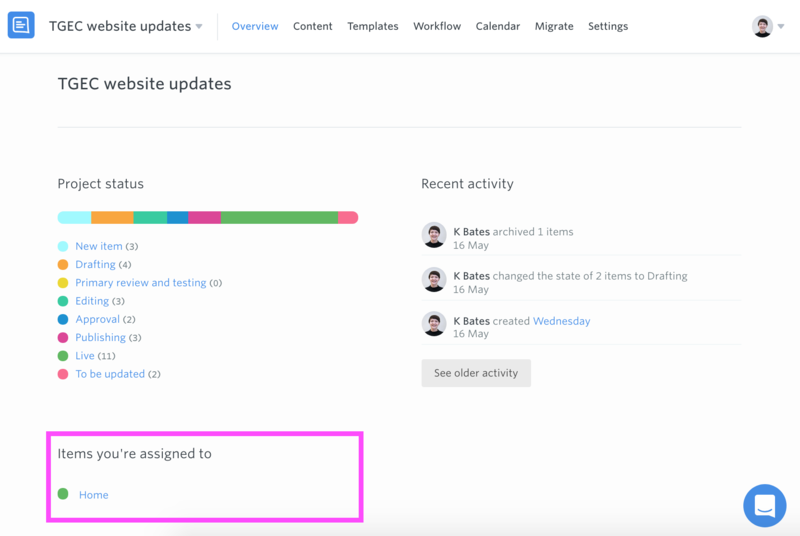 You can also see if an item is overdue, when the next due date is and its current workflow status.